Forty-nine years old Martin Tunbridge, a single man, died on the 3rd of August 1872 from gunshot wounds he received at The Bowers, Ballinrobe on the previous evening. His murder was never solved. By profession, Martin Tunbridge was a process-server and court messenger earning between £70 and £80 per year. His job involved, amongst other things, the serving of eviction notices. By all accounts he was a well-liked and respected member of the Ballinrobe community. His family had been resident in the town for upwards of a century and were associated with St. Mary's Church of Ireland. Martin Tunbridge's profession was not a popular one, particularly with hard-pressed tenant-farmers. Nor would he have been popular with secret societies, that used violence from time to time, to defend tenant-farmers' rights. However, a tenant who feared the prospect of litigation for non-payment of rent would have little to gain by killing a process-server: another would be appointed and the summons would be served in due course. A secret society was probably involved in his murder. On the night of the attack he left the public house of Tim Hare at about ten past ten to go home. He proceeded on as far as 'The Flags', an area in the centre of Ballinrobe, where he was approached by a Ballinrobe shopkeeper, William Fahy, who said to him "there are two strangers after going down the hill, come along and we will have some fun." Fahy said there were two young women with them and he persuaded Tunbridge to join him in observing the young couples. As they went down Bridge Street, Fahy said to Tunbridge that he expected several summonses that week. Tunbridge answered him saying that was not the case as it was now too late in the week to get a summons. Tunbridge had never walked previously with Fahy. Both went through the gate into the Barrack Green, across the Black Walk, under the Metal Bridge, round the steps up by the Cavalry Barrack Bridge. 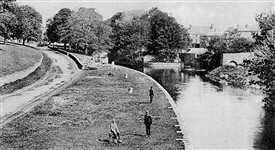 Then they went across the Barrack Green, in the direction of the town, out the gate and round The Quay. Fahy then left him and went into the Black Walk, near the Old Tower. Tunbridge went through the Infantry Barrack gate and down near a large tree at the bridge. He then met Fahy again at a little gate at the end of the Black Walk. 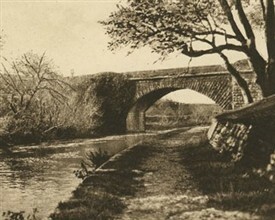 Fahy persuaded Tunbridge to go down towards the Metal Bridge again in search of the men and women. Tunbridge was persuaded to do so despite his opinion that it would be useless, as despite their search so far, they had seen no trace of the couples. On their way down they met a boy who was not known to Tunbridge. William Fahy was on Tunbridge's right hand side as they walked. 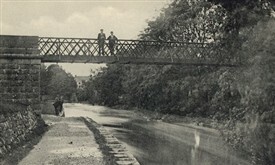 When the men were within about seven yards of the Metal Bridge Tunbridge was shot in the back of the head. He fell down and cried out "Murder". A man, in grey clothes, with a pistol rushed past him, stopped, stepped back and shot Tunbridge in the belly. The assailant fired a third shot, which hit Tunbridge's hat, and the attacker then ran away quickly in the direction of the Barracks. Fahy had by now disappeared. Mr. Tunbridge was unable to say if Fahy fired the shots, and at first thought his assailant was Thomas Frost, an officer's servant at the Barracks. In his second deposition, he indicated that Fahy was probably the person who fired the shots. Mr. Tunbridge managed to get up shortly after the attack and scrambled home without meeting anyone. If Mr. Tunbridge had felt threatened, he surely would not have been led into a quiet, unlit area after dark by a man with whom he never walked before. 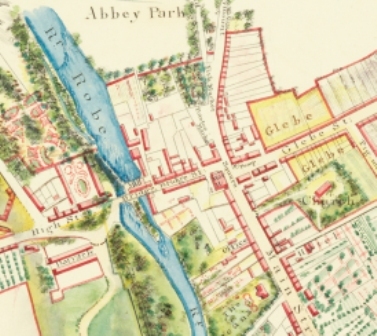 In the subsequent Magisterial Inquiry two witnesses: William Hawthorn of Abbey Street and John Gill, stated that William Fahy was in his own shop at about 10.20 p.m. when they were out on their separate walks. Tunbridge was shot about that time. The jury at the Magisterial Inquiry acquitted Fahy. At the County Assizes, the following March, a claim was brought by Martha McGee, sister of Martin Tunbridge, for £1,000 for the death of her brother. “Sir - Being a friend of yours, I would advise you to stay your proceedings in trying to get processes of ejectment served against a friend of mine. You know who they are. The bailiff refused to do so; have your choice. I being a friend - I remain, Sir yours ..."
Evidence was also brought that William Fahy was a 'connection or relative' of Nally and that he was at Nally's house shortly before the murder and that Fahy had since left the country. Mr. Abbott, Senior Police Inspector stated his conviction that the Tunbridge murder was connected with the Notice to Quit served on John Nally. Mr. Nally has leased lands in the townland of Ballyclogher in the Parish of Balla in 1862 and under the Notice to Quit was expected to surrender the property in November of 1872. John Nally was brother of William Nally Esq., who was under-agent and bailiff on the Lynch Blosse estate. William was father of the Fenian leader P.W. Nally and John W. "Scrab" Nally who was also associated with the Fenian Movement. Note: "The hill", i.e. 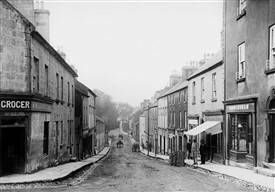 down Bridge Street towards the Bowers, was a noted romantic spot on the banks of the River Robe between the Cavalry and Infantry Barracks. This page was added by Averil Staunton on 03/02/2011.